DuPage County Area Project, or DuCAP for short, is a private, chartered, Illinois 501(c)(3) not-for-profit corporation. We are not a county agency; we are a non-sectarian, non-political organization of public spirited staff and volunteers who develop and sponsor efforts aimed at preventing juvenile delinquency, creating a strong community, and keeping the community’s youth out of trouble. Nothing offers a greater chance for raising a child who shares society’s values than a neighborhood where everyone works together in a positive, cooperative way to care for the children growing up in their community. But how do you mobilize a neighborhood? How do you get people to work together? How do you instill in a child those positive traits that makes he or she choose wisely? How do you create an atmosphere that drives the community to take action and get involved? The answer lies in tapping the natural leadership and concern for community found within each neighborhood. While some delinquency prevention programs try to impose outside policies upon local residents, DuCAP’s philosophy is to encourage the people who live in the neighborhood to see their own solutions. Forming a Neighborhood Action Club (NAC) as the primary force for change does this. The NAC consists of local citizens who encourage participation and effective representation in decisions affecting their neighborhood. Identifying community needs and concerns and organizing Neighborhood Action Clubs (NAC) to actively respond to them. Supporting the communities in their efforts to alleviate conditions which put youth at risk. Assisting Neighborhood Action Clubs in identifying and utilizing available resources. Recruiting and organizing local residents to develop and become involved in the promotion of positive youth development activities. Providing positive role models and constructive activities in order to mold a safer and more productive community. Serving as an advocate on behalf of Neighborhood Action Clubs. Networking with local agencies and organizations to reinforce community involvement. Establish Neighborhood Action Clubs to serve as a formal advisor at each DuCAP site. Increase youth participation in the DuCAP programs and activities. Establish a DuCAP office or facilities for our developing sites. Enhance public awareness of DuCAP’s mission. Discover potential sites within DuPage and Will Counties that would benefit from our services. What age groups does DuCAP serve? 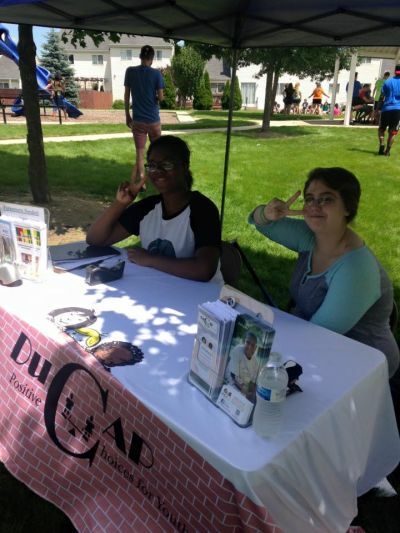 DuCAP works with all ages from the youth to the senior citizens, but with the primary emphasis on individuals ranging from ages 11-24 and their immediate families. What communities does DuCAP serve? DuCAP has programs and Neighborhood Action Clubs in a variety of neighborhoods. We currently serve: Bolingbrook, Romeoville, Glendale Heights, Wheaton and Bensenville. We have served the following communities in the past: Addison, Downers Grove, Lombard, South Hinsdale, Villa Park, West Chicago, Wood Dale, Hanover Park, Carol Stream and Woodridge. Where does DuCAP receive its funding from? DuCAP receives its funding through various state and private grants. Our primary funding comes from the Illinois Department of Human Services (IDHS). DuCAP also receives funding though donations, fundraisers, and other charitable contributions.